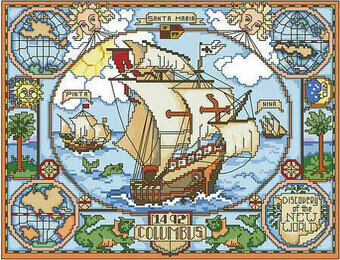 Stitch this beautiful antique Old World Map from the voyages of Christopher Columbus. 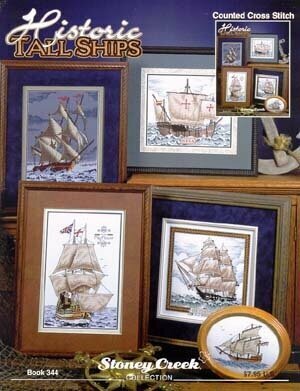 Makes a perfect gift for travelers, explorers, discoverers, map-lovers and those who love History. 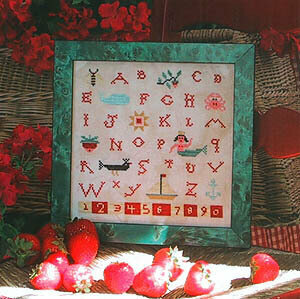 Stitch Count 170w X 130h. Finished size on 14 ct 12-1/8" X 9-1/4". 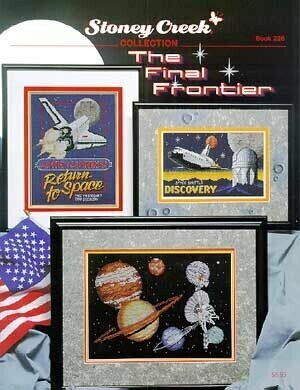 Design stitched on 14 Count Touch of Blue Aida. Design by Linda Gillum. 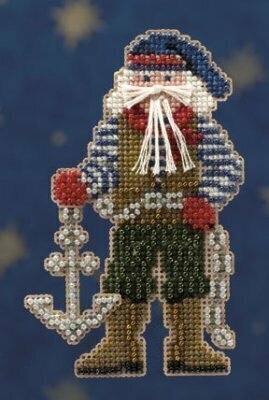 Model stitched on 40 Ct. Tin linen by Fabric Flair with Gloriana Silk Floss (or DMC 3052, 927, 437, 839, 930, 3041, 926, 3722). Stitch Count: 185W x 173H. 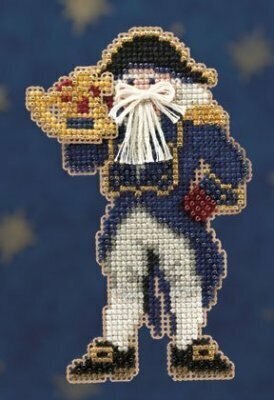 Model stitched on either a 36/40 Ct. fabric of your choice. 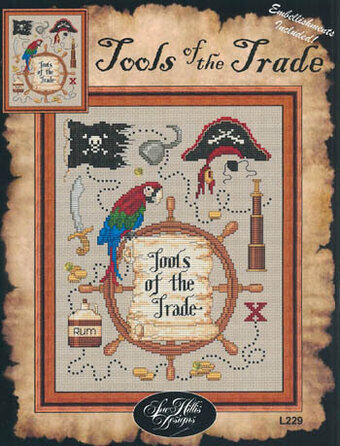 There are no partial stitches - design is suitable for stitching over one or on Aida fabric. 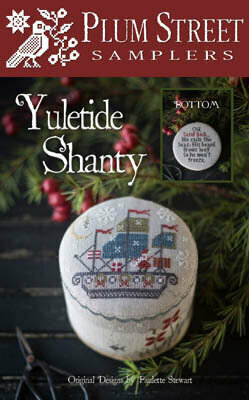 You can stitch with either 11 Skeins of DMC or 8 skeins of Gloriana floss. For 2 strands on 28 count, this is approximately 29 skeins of DMC. Color of your choice. Stitch count 345x421. 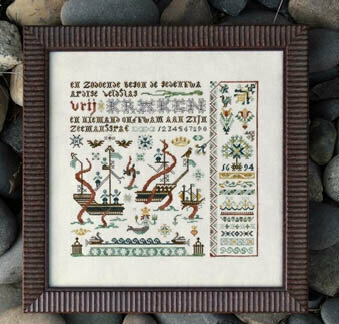 Celebrate your inner mermaid by stitching this whimsical Mermaid Sampler. Model stitched on 32 count Barn Owl Linen using Weeks Dye Works Threads and DMC floss. 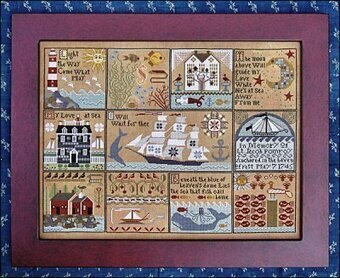 Stitch count: 109W x 110H. 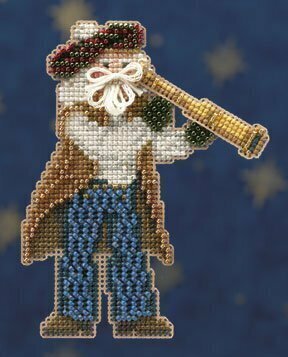 Complete kit includes 16 Ct. pale blue Aida, pre-sorted cotton thread, needle, pattern and instructions. Finished size: 14" x 10.4" Based on the artwork of Amanda Loverseed. Make meal time an adorable experience with the Ships Ahoy Bib Pair by Bucilla. 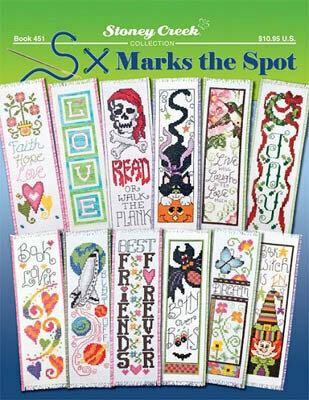 Kit includes pre-quilted/pre-finished, 70% polyester/30% cotton fabric stamped in washable blue ink, 100% cotton embroidery floss, needle, and instructions. Size: 9" x 14". More Info: Set of 2, Hook & Loop Closure. By Joan Elliot. Model stitched over 2 threads on 36 Ct. Weathered Shingle by R&R Reproductions with Weeks Dye Works floss (or DMC 310, 356, 422, 535, 642, 3865, 924, 928, 3011, 3768, 3773, 3777, 3799). Stitch Counts: Side - 216Wx 58H, Top - 75W x 61H, Bottom - 57W x 55H. "Row, row, row your boat, gently down the stream. 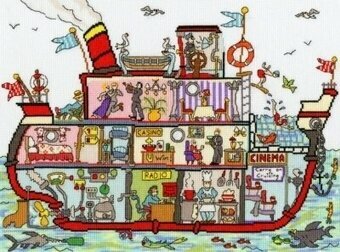 Merrily, merrily, merrily life is but a dream." Model stitched over 2 threads on 28 Ct. Antique White linen with Weeks Dye Works floss. Also required, but not listed above, Rainbow Gallery Silk Lame (SP94 - 2 cards). Stitch Count: 114x187. 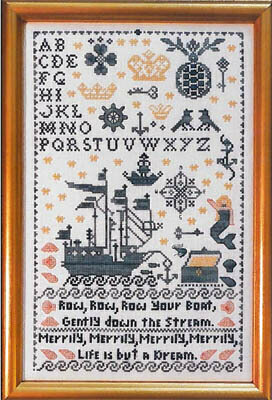 The darling Ships Ahoy Birth Record will commemorate baby's arrival in style. Kit contains 14-count white Aida, cotton floss, needle, floss separator, and chart. Size: 9.50" x 13.25". By Joan Elliot. 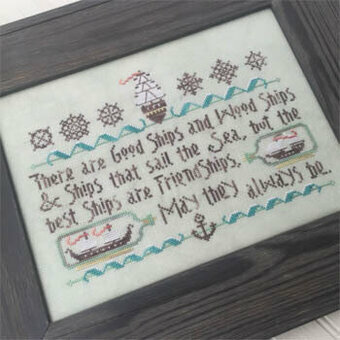 The Ships Ahoy crib cover from Bucilla makes a thoughtful gift to accompany any nursery decor. The kit includes 1 pre-quilted/pre-finished crib cover made from 70% polyester/30% cotton fabric stamped in washable blue ink, 100% cotton embroidery floss, needle, and instructions-everything you need to commemorate bringing home baby. Size: 34" x 43". By Joan Elliot. Journey with us as we explore the vast oceans with these historic ships - includes U.S.S. 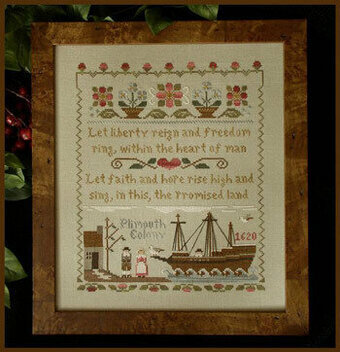 Constitution stitch count 135x134, The Mayflower stitch count 114x165, The Storm stitch count 116x149, Nina stitch count 137x119, and "Smooth Sailing." 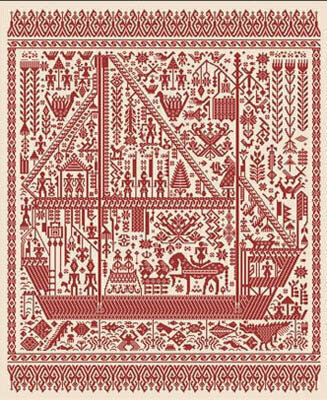 Stitch count 87x66. 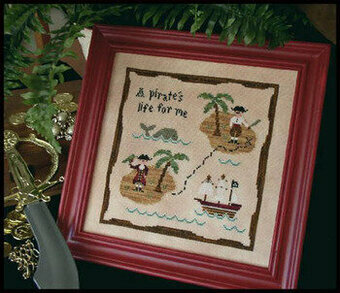 Kit includes: 18 count cream fabric, floss, needle, chart, instructions and color photo of finished project. Finished size is 8.75" x 8.5".